Working in the field of open social innovation, and most especially when one considers institutions as platforms for civic engagement, it is almost unavoidable to think of the personal learning environment (PLE) as a useful tool for conceptualising or even managing a project, especially a knowledge-intensive one. Let the definition of a PLE be a set of conscious strategies to use technological tools to gain access to the knowledge contained in objects and people and, through that, achieve specific learning goals . And let us assume that a knowledge-intensive project aims at achieving a higher knowledge threshold. That is, learning. Extraction of information and knowledge from the environment. Management and transformation of information and knowledge to add value. Dissemination, outreach and knowledge transmission. These stages usually happen sequentially and on a much independent way one from another. They even usually have different departments behind. This is perfectly valid in a world where tasks associated to information and communication are costly, and take time and (physical) space. Much of this is not true. Any more. Costs have dropped down, physical space is almost irrelevant and many barriers associated with time have just disappeared. What before was a straight line — extract, manage, disseminate — is now a circle… or a long sequence of iterations around the same circle and variations of it. I wonder whether it makes sense to treat knowledge-intensive projects as yet another node within a network of actors and objects working in the same field. As a node, the project can both be an object — embedding an information or knowledge you can (re)use — or the reification of the actors whose work or knowledge it is embedding — and, thus, actors you can get in touch trough the project. 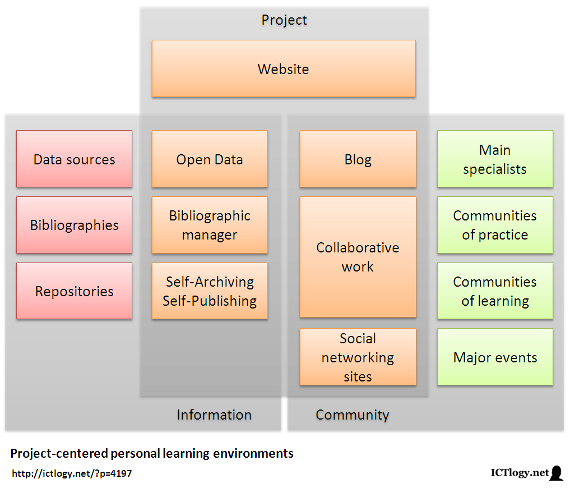 A good representation of a project as a node is to think of it in terms of a personal learning environment, hence a project-centered personal learning environment (maybe project knowledge environment would be a better term, but it gets too much apart from the idea of the PLE as most people understands and “sees” it). The institutional side of the project, which includes all the data gathered, the references used, the output (papers, presentations, etc. ), a blog with news and updates, collaborative work spaces (e.g. shared documents) and all what happens on social networking sites. The inflow of information, that is data sources, collections of references and other works hosted in repositories in general. The exchange of communications with the community of interest, be it individual specialists, communities of learning or practice, and major events. These areas, though, and unlike traditional project management, interact intensively with each other, sharing forth information, providing feedback, sometimes converging. The project itself is redefined by these interactions, as are the adjacent nodes of the network. Open social innovation (includes political participation and civic engagement). In all these types of project knowledge is central, as is the dialogue between the project and the actors and resources in the environment. Thinking of knowledge-intensives projects not in terms of extract-manage-disseminate but in terms of (personal) learning environments, taking into account the pervasive permeability of knowledge that happens in a tight network is, to me, an advancement. And it helps in better designing the project, the intake of information and the return that will most presumably feed back the project itself. What is the set of sources of data, bibliographies and repositories we use as a whole as the input of our projects. What is the set of specialists, communities of practice and learning, and major events with which we usually interact, most of the times bringing with us the outputs of our projects. Summing up, conceiving projects as personal learning environments in advocacy, e-research and open innovation can help both in a more comprehensive design of these projects as in a better acknowledgement of our own personal learning environment. And, with this, to help in defining a better learning strategy, better goal-setting, better identification of people and objects (resources) and to improve the toolbox that we will be using in the whole process. And back to the beginning. Peña-López, I. 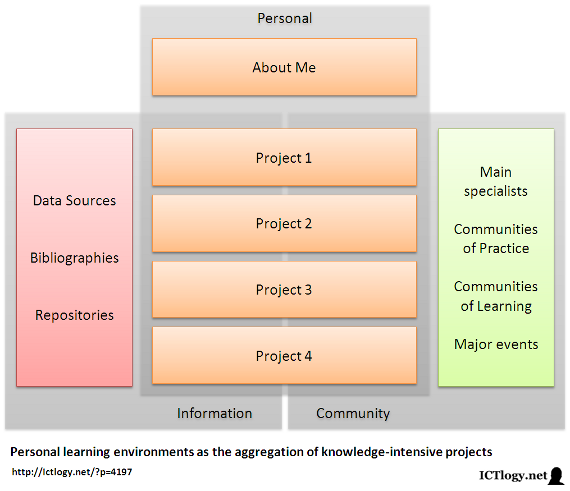 (2014) “Project-centered personal learning environments in e-research and open social innovation” In ICTlogy, #130, July 2014. Barcelona: ICTlogy. I would like to thank you for this awesome blog, I am doing my Phd in educational technology field, especially in using digital technology for designing PLE, at Cairo University in Egypt, I hope we can communicate in related issues. Creo que un lugar excelente donde comenzar es la tesis doctoral de Oriol Miralbell, Webs de xarxes socials i intercanvi de coneixement. Anàlisi de l’adopció i l’ús dels membres de les comunitats virtuals professionals del turisme. Está en catalán, pero no creo que suponga una barrera infranqueable. Dedica largo y tendido a la cuestión de las comunidades de práctica y de aprendizaje, y la bibliografía es excelente.